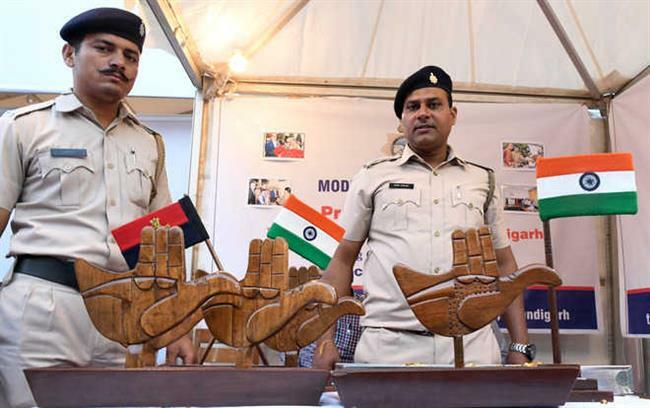 Over a decade after the Burail Jail authorities displayed products made by jail inmates at a CII fair in Sector 17, the jail authorities have made a comeback to the fair this year with a wide range of products, including candles made by inmates, especially for the festival of lights. The jail authorities displayed their products at the fair today. Before this, they had showcased their products at the CII fair in 2007. The furniture made by jail inmates — a variety of wooden chairs, including a baby chair, cabinets, wooden insignia, candles and food products — were displayed at the fair. OP Mishra, IG (Prisons), said the response from the public on the first day was overwhelming. “Products such as candles, wooden flag stand, insignia and chairs for children sold like hotcakes. In fact, we ran short of products,” the IG said. Today, seven baby wooden chairs, five single flag stands, 14 Open Hand souvenirs, 226 boxes of candles and various food items were sold. The IG said a feedback diary had been kept at the stall to know people’s views, which would help them improve their products. “We are expecting a similar response from visitors tomorrow,” he said. The jail authorities are expecting a similar response on the last day of the fair. “The visitors can also book their products at the stall, which can be collected later from the jail store,” said an official.